For lots of industries, 2016 hasn’t been the best year but one sector that remains strong is the tech industry. Whether it's cloud computing or social media, internet security or software, the technology industry is flourishing with continuous growth and innovation. This growth brings success to all of those involved. Therefore, it’s plain to see that 2016 so far has been an excellent year for tech entrepreneurs and CEOs. In fact, many of the richest people on the planet work in or are in some way involved in the technology industry. Forbes Magazine, the well-known financial business magazine, recently compiled a list of the top one hundred richest people in the technology sector. When their wealth is combined, these gifted and capable individuals are worth a massive $892 billion! Successful tech entrepreneurs are so wealthy that their minimum net worth is $2.2 billion. With this in mind, ERS solutions created this interesting infographic below that reveals the top ten richest individuals in the tech industry. 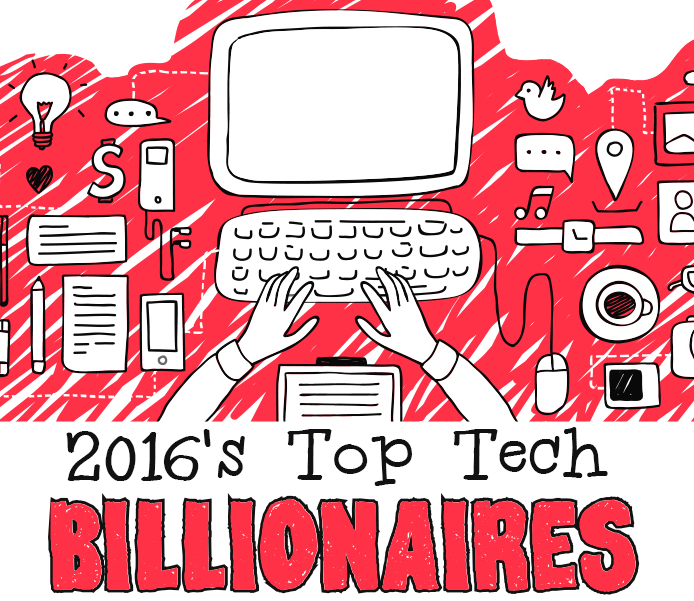 The infographic also features the countries that have the most technology billionaires. China, Canada and the United States all have the most tech billionaires residing there. Australia & Brazil also make the list alongside some other countries. It reveals an interesting statistic – did you know that thirty seven of the fifty one billionaires living in the United States live in the state of California? The top ten list includes Amazon founder Jeff Bezos. Bezos founded Amazon.com (the most popular online store of books, products and services). Bezos has a fortune of approximately $66.2 billion. This makes Bezos one of the richest tech billionaires on earth. The success of Amazon continues to rise, and astonishingly, Bezos’ fortune has grown by over $18.4 billion over the past year. It also features Jack Ma. Jack Ma founded the Alibaba Group. The Alibaba Group is one of China’s most successful companies – it is an e-commerce firm that hosts numerous prosperous Internet-based businesses. With an estimated fortune of $25.8 billion, Jack Ma is one of China’s wealthiest entrepreneurs. Currently, Jack is CEO of the Alibaba Group. Michael Dell, Chairman and CEO of Dell also makes the top ten. As the founder of Dell Inc., one of the world’s leading sellers of personal computers (PCs), Michael Dell’s fortune is estimated at over $20 billion. To find out who else made it into the top ten list, let’s check out the infographic below! Which of these tech individuals had the biggest impact on IT? Let us know your opinion in the comment section below!